England responded to its underwhelming defeat to Canada with a 2–1 victory against Jorge Vilda’s Spain in front of 13,000 supporters in Swindon. Goals either side of the break from Beth Mead and Ellen White were enough to record the win but Aitana Bonmatí’s goal from close range ensured a tense finale on a night in which Spain once again dominated possession. England saw just 37 percent of the ball, up 15 percent from the last time the side’s met in Breda at Euro 2017 two months ago, but it was the Lionesses who once again proved more clinical in front of goal. Neville made nine changes to his side, handing a first senior start to goalkeeper Ellie Roebuck, who kept a clean sheet and was relatively unflustered during her 45 minutes, as well as starts to fellow youngsters Georgia Stanway and Leah Williamson. Spain came out of the blocks quicker, though, and allowed England to barely lay a glove on them in the opening 15 minutes because the Lionesses grew into the match and largely dominated the half hour leading up to the break. “The first twelve minutes I don’t think we touched the ball,” said Neville. “All of a sudden, rightly or wrongly, Jill Scott makes a tackle and the whole game changes. Everybody went on the front foot and they lost the shackles — I started to enjoy it. Neville introduced Mary Earps at the break, a preplanned substitution, before Lucy Staniforth and Chioma Ubogagu both came on before the hour. And Neville admitted post-match he made the changes to cause his own team some difficulties rather than the opposition. “I made two subs just after halftime because I wanted us to suffer, I wanted to see what we were like with them charging at us,” he said. “I knew the subs would break the rhythm but I wanted to see how the back four would cope, how the goalkeeper would cope, how we’d cope not having the ball. England mustered five shots on target, up three from Friday’s game against Canada but they were more clinical both in front of goal and with their final ball against Spain. White and Mead had already threatened to combine once when the former set the latter up for a tap-in shortly before halftime and White showed no mercy when lashing one into the top corner just 37 seconds after the interval. 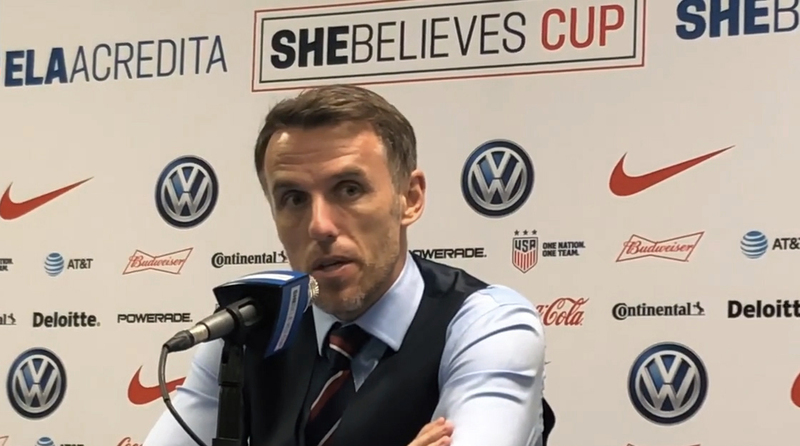 While other chances came and went and England ultimately allowed Spain back into the game when Mariona Caldentey beat Rachel Daly and set up Bonmatí, Neville was pleased with the attacking side of the game in comparison to Friday.